This recipe is so easy and the best part is that it can be made ahead of time. Actually it should be made at least a day ahead and frozen or can be frozen up to 3 days. It’s not too sweet and you don’t have to flip an entire tart tartin over onto a platter while it’s still piping hot. The crust is made separately too. Actually it’s a Sablé Breton but any type of sugar cookie would be fine or bake off rounds of puff pastry. You get the idea — use your imagination. 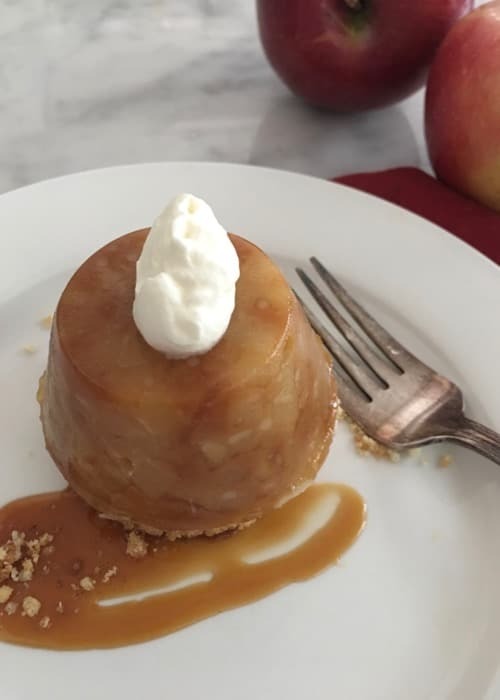 The crème fraîche and caramel sauce can also be made ahead and stored in the refrigerator for up to a week. Or, add a scoop of the best vanilla ice cream you can get your hands on! Add honey and butter to a large non-stick skillet. Measure out the cream and have it close at hand. Bloom the gelatin sheets in just enough cold water to cover. Set aside for about 10 minutes or until they are pliable. Remove the gelatin sheets from the water and set them aside. Peel and cut the apples into ¼-inch dice. Heat honey and butter in the non-stick skillet swirling until melted and begining to simmer. 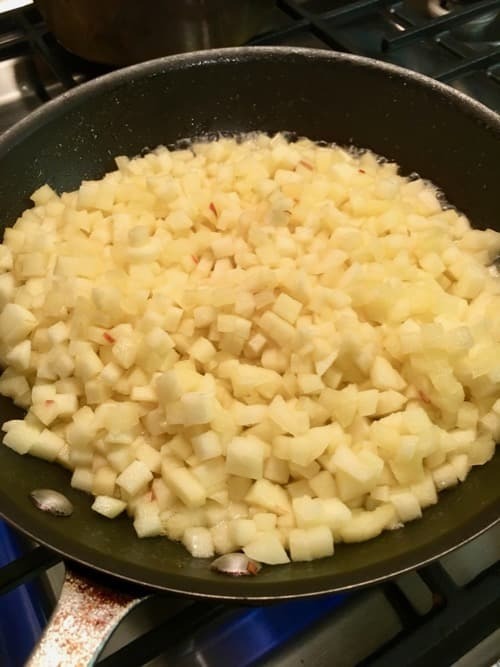 Add diced apples and cook just until soft and some begin to brown. Remove from heat and set aside. In a medium saucepan pour the sugar into the middle of the pan. Pour just enough water onto to the sugar to get it wet. Set pan over medium heat and carmelize the sugar until medium amber in color. (The more water you add the longer it will take to caramelize as all the water must first evaporate.) With a pastry brush dipped in a bit of water, brush down the sides of the pan as necessary to prevent sugar crystals of forming. Swirl the pan so that the amber colored sugar is uniform throughout the pan. Immediately remove the pan from the heat and pour in the cream, stirring to combine. Stir in the bloomed gelatin. Pour the caramel sauce into the sautéed apples and stir to combine. Place a 6-portion silicone mold on a small sheet pan. Divide the apple mixture evenly (about 1/3 cup per mold) gently pressing down the apple mixture. Freeze overnight or up to 3 days. A couple of hours before serving (even up to 4 hours ahead) unmold the frozen tartines and place them on a piece of parchment paper to thaw. Using an off-set spatula set each tartin on a sablé and then plate. Serve with a dollop of crème fraiche, caramel sauce and or vanilla ice cream.